Modell: ThinkPad T440s. Absoluter TOP Zustand, siehe Foto, so gut wie keine Gebrauchsspuren. Tastaturlayout: original deutsch QWERTZ. spritzwassergeschütze Tastatur. Kartenlesegerät: SD-Kartenleser. Arbeitsspeicher: 8 GB DDR3-SDRAM (1600 MHz). 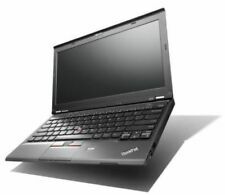 This is a Lenovo Thinkpad T440 Laptop. 500gb Hard Drive. It is loaded with Windows 7 Professional 64 bit, Open Office and AVG Antivirus software. The Full Spec of the laptop is. It has been used but is in very good condition. 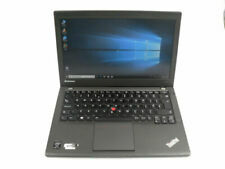 Lenovo Thinkpad T440p 8gb Ram Windows 7 240gb SSD Intel i5 2.6Ghz. It has 8gb ram and a 240gb SSD hard drive. The laptop is in good condition, and perfect working order. It's running Windows 10 Pro 64 bit. Refer to the pictures for further detail. DVD ROM DRIVE. 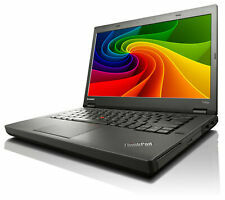 Notebook Lenovo ThinkPad T440p. Daher ist der Akku von der Gewährleistung ausgeschlossen und versteht sich als kostenlose Zugabe. Die auf den Batterien abgebildeten Symbole haben folgende Bedeutung: Das Symbol der durchgekreuzten Mülltonne bedeutet, dass die Batterie nicht in den Hausmüll gegeben werden darf. Lenovo Thinkpad T440p 8gb Ram Win 7 240gb SSD Intel i5 2.6Ghz y estación de acoplamiento. Also included is a Lenovo ThinkPad Pro Docking Station. This docking station allows the laptop to sit on top and add extra connectivity ports listed below 1 x Set of keys to lock the laptop onto the docking station for security (works if the docking station is fixed to a desk / table with a security lock - not supplied). PORTATIL LENOVO T440S OCASION Descripción del artículo Procesador Intel Core I7-4TH GEN. 12Gb Ram 240Gb SSD Pantalla 14" Tactil 3 x USB 3.0 1 x VGA 1 x RJ-45 1 x Mini Display Lector de Tarjetas 4 en 1 (SD/SDHC/SDXC/MMC) Batería Cargador Teclado en Ingles (con kit de conversion a Español) - Sistema Operativo instalado Windows 10 - Licencia Windows 8 Pro. Lenovo Thinkpad T440p. 4GB RAM DDR3. Windows 10 Professional. We include exactly what is shown in the photographs, nothing more and nothing less. Solid State Drive: 256GB. Optical Disk Drive: DVD/RW. Microsoft Office 2016 WE TEST EVERY ITEM PRIOR TO DISPATCH TO ENSURE THAT THE PRODUCT IS 100% WORKING BEFORE IT LEAVES US. OS: Window 10 Pro 64-Bit. Lenovo ThinkPad T440s. Lenovo ThinkPad E431. Lenovo ThinkPad E531. Lenovo ThinkPad S431. Lenovo ThinkPad S3. Lenovo ThinkPad S3 Touch. Lenovo ThinkPad S5. Lenovo ThinkPad S440. Lenovo Thinkpad T440 con teclado retroiluminado. DISCO DURO:500GB SSHD disco duro híbrido con 8GB SSD (mucho más rápido que el disco duro convencional). Gama de portátiles profesionales de Lenovo, un extra de calidad y fiabilidad. Lenovo Thinkpad T440p. Consulta sin compromiso! DISCO DURO:256GB SSD. Gama de portátiles profesionales de Lenovo, un extra de calidad y fiabilidad. PANTALLA:14" LED HD con resolución 1600x900. Para más detalles mirad las fotos. 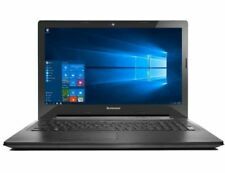 Lenovo ThinkPad T450s Core i5-5200U 2,2GHz 8Gb 500 Gb HDD Windows10 FHD 1920x1080. Modell ThinkPad T450s. Batterien, die Schadstoffe enthalten, sind mit dem Symbol einer durchgekreuzten Mülltonne gekennzeichnet. i5 4300U ( 1,9 GHz), 4 GB RAM, 320 GB, 14 1600 x 900 LCD, Intel HD graphics, Intel wireless, 1 GB Ethernet, UltraNav, secure chip, WebCam, ion de Li, Win10 Pro 64 bits. 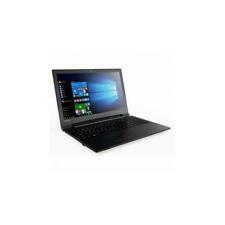 OFERTA ULTIMA UNIDAD LENOVO THINKPAD T440 I5-4300U / 8GB /120GB SSD /W10 /14"
LENOVO PORTATIL T440 I5-4300U/8GB DDR3/120GB SSD / W10 / 14" REACONDICIONADO CLASE A. Disco duro: 180 Gb SSD. Pantalla: 14″. 1x Lector tarjetas 4 en 1. 1x Smart Card. 1x Conector de acoplamiento docking station. Tarjeta de credito. Envíos a toda España 24/48h por agencia privada. 1 año completo de garantía. Arbeitsspeicher: 8 GB. Bildschirm-Diagonale: 14". Tastaturlayout QWERTZ (deutsch) beleuchtet. Auflösung: 1600x900. WLAN eingebaut. Laufwerke:256 GB SSD. Extras: CardReader, FingerPrint-Reader, Bluetooth, LTE. Lenovo ThinkPad T440p. 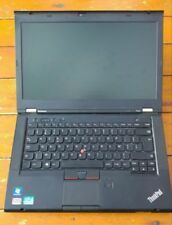 Eine gebrauchts Notebook Lenovo ThinkPad T440p. 128GB SSD-Festplatte. 128GB SATA SSD-Festplatte. Arbeitsspeicher Server. Arbeitsspeicher PC. Funkmodul: vorbereitet. Mainboard: Lenovo 20AWS04Y00. Lenovo T440s. 1x Lenovo T440s Core i7(usato). 3x USB 3.0. Display 14" 16:9. I nostri computer vengono re-installati da zero con la versione originale del PC (in questo caso stiker Windows 7 Pro 64Bit aggiornato a Windows 10 Pro 64Bit originale). A-ware, deficiencias libre, Windows 10 Pro + Open Office Inst. Lenovo Thinkpads T440P. optisches Laufwerk: DVD. Original deutsche beleuchtete Tastatur. Bei der Neuinstallation von Windows 10 hat sich das Gerät automatisch wieder aktiviert. Es ist ein Windows 7 Pro Sticker unter dem Akku des Gerätes werksseitig vorhanden. LENOVO THINKPAD T440. DISPLAY 14" CON RISOLUZIONE 1600 X 900. WINDOWS 10 PROFESSIONAL 64 BIT. L' USATO DI QUALITA'. 8 GB DI RAM. 180 GB DI HARD DISK. LETTORE DI SCHEDE SD. LETTORE DI SMART CARD. I7 4600U ( 2,1 GHz), 4 GB RAM, 320 GB, 14 gráficos Intel HD de 1920 x 1080 4400 (IGP), IPS, multitouch, wireless de Intel, 1 GB Ethernet, UltraNav, chip seguro, WebCam, 3 c Li-ion, Win10 Pro 64 bit.